Disclaimer/Disclosure: I was not paid or compensated in any way to write this review. I am not affiliated with the company that manufactures and distributes this product. I paid for this product with my own funds. This review reflects my own experience with and opinion of the product as a consumer. I am not a medical doctor so consult a doctor for advice about illness or whether this product is safe for you. I have been using baby wipes for a number of years. I don’t have any babies (yet), but I find that baby wipes are very useful for adults. I started using them long before flushable wipes like Cottonelle brand or Vagasil feminine cleansing wipes were popular. I use them mainly for freshening up during the course of the day. I am a very peculiar person and after I use the toilet I feel very self-conscious. I don’t feel clean even after thoroughly wiping with toilet paper. Human beings have normal flora or bacteria that exist naturally in our bodies and on the skin. Normal bacterial flora are necessary to help keep humans healthy. However, the bacteria produce waste products and this along with sweat, and other human excretions can cause body odor. So, to make a long story shorter, I don’t want to walk around smelling like sweat, piss and doo-doo. By the way, baby wipes are also quite awesome for use during menstrual periods. My first choice would be to grab a bar of soap and just jump in the shower after using the toilet. As you already know, that’s not always practical. This is where baby wipes are a major solution to a major problem. I carry them with me every where I go, either in a pocket or my purse. They are available in small re-sealable packs, but it is cheaper to purchase them in larger sized packages. I usually buy the 184 count refill bags or larger boxes of baby wipes. In fact, I recently purchased a 448 count box of Huggies Natural Care baby wipes for $11 (minus coupons and other discounts) at Target. Most of the time I get unscented versions of baby wipes, because I don’t particularly like the idea of smelling like a baby. If you plan on using them, make sure to store the wipes at room temp and tightly reseal the package. This will help prevent the wipes from drying out. Also, I don’t flush baby wipes because I don’t think that most are biodegradable or safe for plumbing. Another good use for baby wipes is to clean your hands. I am one of those people who are always in a rush and usually eat on the go. If I can’t get to a restroom to wash my hands prior to eating, I whip out a couple of wipes to clean my hands. They are pretty good for cleaning hands after eating, provided that your hands aren’t too messy or sticky. My boyfriend likes using them after he helps me check the oil and fluids in my car. 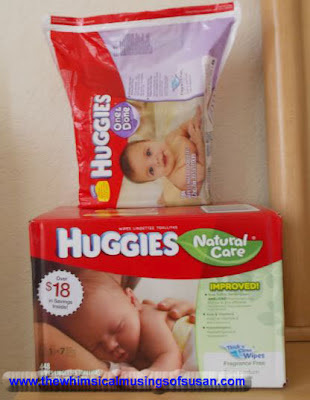 I have tried many brands of baby wipes including Huggies, Pampers, Luvs, and store brands/ private label products. Many of them are good and effective but Huggies Natural Care, Thick “N” Clean is the brand that suits my needs the most. I like the texture of these baby wipes, because they are gentle, yet they have a grit to them. They aren’t abrasive at all. Each wipe is thick and durable, so they don’t break up easily with the rigors of cleaning. The texture is just gritty enough to remove dirt and debris in just a few strokes. I have sensitive skin and Huggies Natural Care baby wipes have never caused me to get a rash or any other adverse reaction. I am a little confused as to why this product was labeled “natural”. Although it contains some natural ingredients like water and aloe, I don’t consider it natural at all. There are some chemicals in this product, which were obviously created in a laboratory.